A complete modern experience for using Super 8 film. It includes a cartridge of super 8 film, a pre-paid mailing envelope to send the roll to our lab, chemical processing of the film, digital film scanning, and encoding to a universal computer file format. The digital file will be emailed to the end user for downloading and the original film mailed to them on an archival safe reel for preservation. 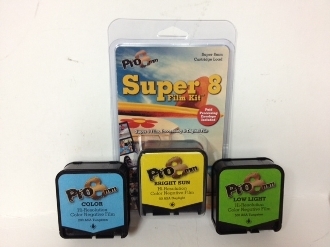 3 versions of the Super 8 Film Kit are available – Bright Sun, Color, Low Light.